Sometimes in the embedded system world we need to process the analog world and sending the signal to the microcontroller when the analog signal exceed some predetermine limit we’ve set. Some example of this situation is to send the interrupt signal to the microcontroller operation when the temperature is already exceeds certain limit or the light intensity exceeds certain bright level. This is when the comparator circuit becomes handy as it’s designed specially for this purpose. When you look closely to the comparator symbol, some of you will recognize it as the Op-Amp (Operational Amplifier) symbol, so what make this comparator differ from its big brother; Op-Amps is designed to accept the analog signal and outputting the analog signal while the comparator only outputting the digital signal; although the ordinary Op-Amp could be used as the comparator such as the popular National Semiconductor LM324 quad Op-Amps, but the real comparator is designed to have a faster switching time comparing to the multipurpose Op-Amps. Therefore you could say that the comparator is the modified version of the Op-Amps which specially designed to give the digital output. The comparator circuit work by simply taking two analog inputs, comparing them and produce the logical output high “1” or low “0“. By applying the analog signal to the comparator + input called “non-inverting” and – input called “inverting“, the comparator circuit will compared this two analog signal, if the analog input on + input is greater than the analog input on – input (inverting) then the output will swing to the logical “1” and this will make the open collector transistor Q8 on the LM339 equivalent circuit above to turn ON. When the analog input on + input (non inverting) is less than the analog input on – input (inverting) then the comparator output will swing to the logical “0” (the Q8 transistor turn OFF). Furthermore on this tutorial, I will use the term non-inverting and inverting instead of + input and – input on the comparator analog input. 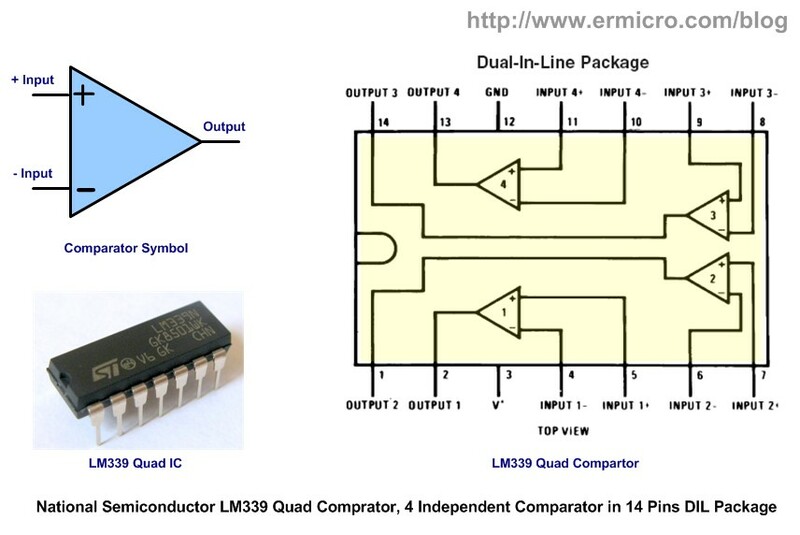 As you’ve seen from the LM339 equivalent circuit picture above, the LM339 use an open collector transistor Q8 for its output, therefore we have to use what is called “pull-up” resistor connected to the Q8 collector lead with the Vcc in order to make this Q8 transistor work. The maximum current that could flow on this Q8 transistor (output sink current) according to the LM339 datasheet is about 18 mA. For more information about the voltage divider circuit please refer to my previous posted blog Basic Resistor Circuit. The comparator non-inverting input is connected to the 10 K trimport which is also forming the voltage divider circuit where we could adjust the V+ voltage start from 5 volt down to 0 volt. First when the V+ is equal to Vcc (5 volt) the comparator output will swing to the logical high (Vout = Vcc) because the V+ is greater than V- (2.5 volt). This will switch the Q8 transistor OFF and the LED will turn OFF. When the voltage V+ drop bellow 2.5 volt, the comparator output will swing to the logical low (Vout = GND) and this will switch the Q8 transistor ON and the LED will turn ON. By swapping the analog input; the R1 and R2 voltage divider connected to the non-inverting input (V+) and the trimport connected to the inverting input (V-) we will get the opposite output result. Again using the voltage divider principal the voltage on the non-inverting input (V+) is about 2.5 volt, therefore if we start the inverting input voltage (V-) at 5 volt; the V+ is lower than the V-, this will make the comparator output will swing to the logical low (the Q8 transistor ON) and the LED will turn ON. When we adjust the V- down bellow the 2.5 volt (V+) than the comparator output will swing to the logical high (the Q8 transistor OFF) because the V+ now is greater than V- and the LED will turn OFF. You could see all of this experiment on the video at the end of this tutorial. As you’ve seen from the experiment above, the comparator is usually used to compare one variable analog signal with predetermined analog signal or we could call it as the reference voltage. Therefore by placing the reference voltage to the inverting or non-inverting input we could manage the comparator output accordance to our need. 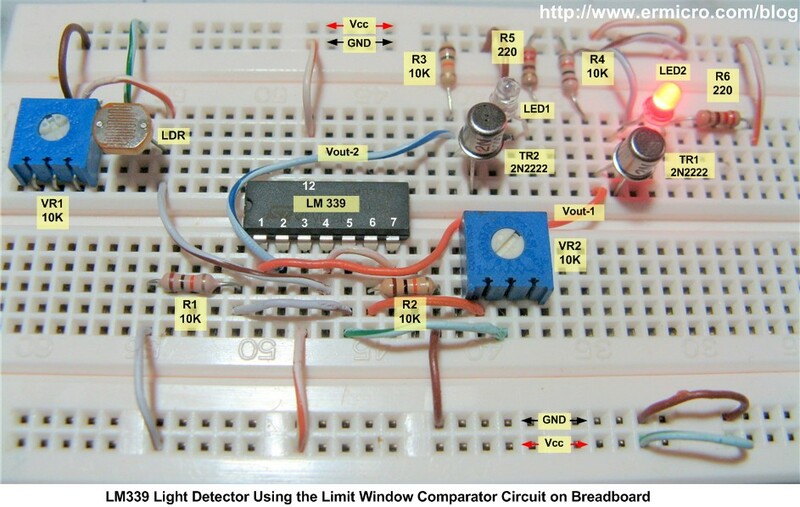 This comparator circuit is also known as the zero crossing detector circuit. The following schema show you how we utilized the zero crossing detector circuit in the infra-red reflective detector usually found in many robotics projects. When the infra-red LED beam reflected back to the photo transistor, the photo transistor will turn ON; this will make the reference voltage (V+) become greater than the input voltage (V-). 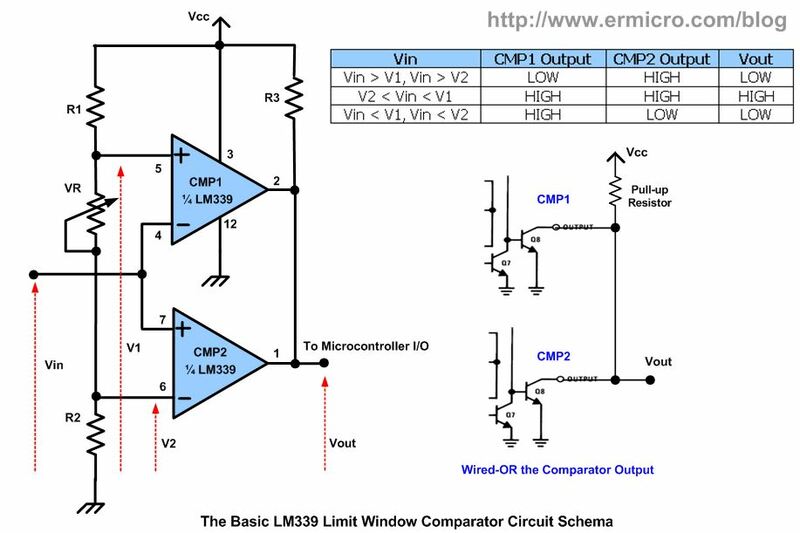 This condition will make the comparator give a logical high to the microcontroller I/O port. When the infra-red LED beam is blocked, the photo transistor will turn OFF; this will make the input voltage (V-) become greater than the reference voltage (V+) and the comparator will give a logical low to the microcontroller I/O port. Hmm, by applying the circuit schema above to all the comparators in the LM339 package (four comparators), we could make a very sensitive infrared reflector sensors for sensing the black/white line used in many line follower or line maze solver robot. 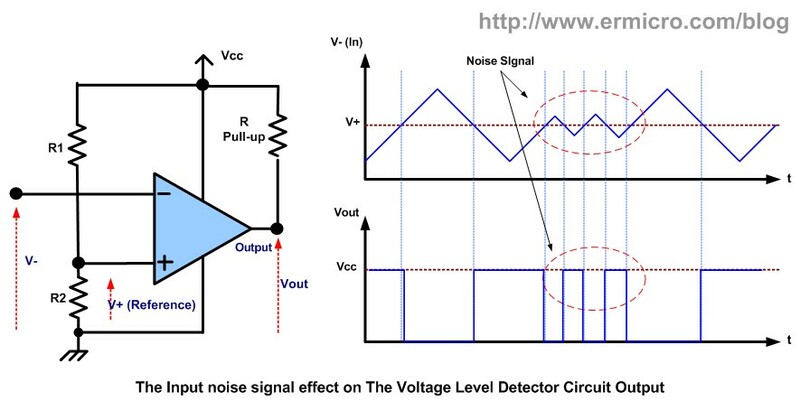 To analyze this circuit first we assume the output voltage is high; in order to meet this condition the V- (inverting input) voltage should be lower than the V+ (non-inverting input) voltage. When the V- voltage increases toward the V+ voltage, this will drive the Vout toward ground which will also shift the V+ voltage through the R3 resistor. Because the V+ is the non-inverting input to the comparator; this feedback will help to drive down the Vout to ground even faster. 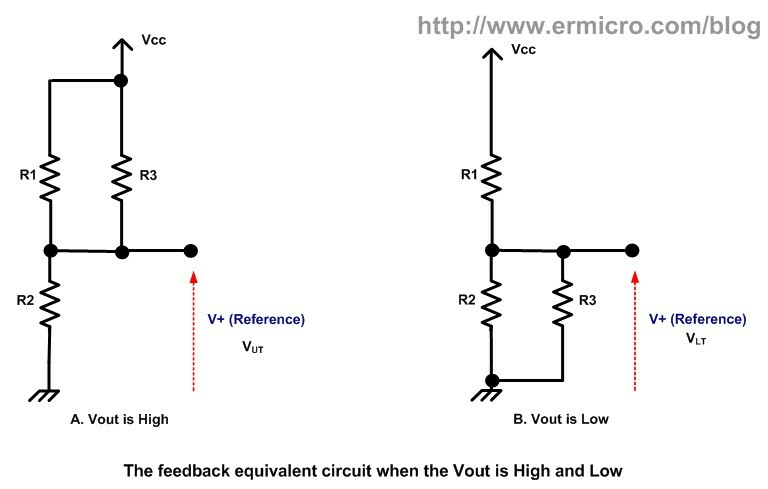 The opposite condition also occur when the V- voltage decrease, because of the R3 resistor feedback on the V+ input; this feedback will shift the V+ voltage input will ensure a faster switching result to logical high (Vcc) on the Vout. The V+ voltage upper threshold (VUT) to make the Vout voltage to swing to ground could be calculated as this following formula. R1||R3 = (R1 x R3) / (R1 + R3). VUT = (Vcc x R2 x (R1 + R3)) / (R1 x R2 + R1 x R3 + R2 x R3). The V+ voltage lower threshold (VLT) to make the Vout voltage to swing to high (Vcc) could be calculated as this following formula. R2||R3 = (R2 x R3) / (R2 + R3). VLT = (Vcc x R2 x R3) / (R1 x R2 + R1 x R3 + R2 x R3). VH = (Vcc x R1 x R2) / (R1 x R2 + R1 x R3 + R2 x R3). 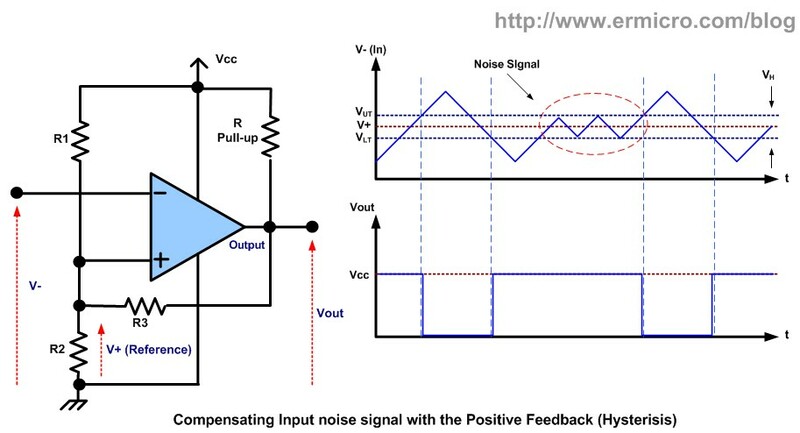 Therefore by shifting the V+ voltage with the R3 feedback resistor we could compensate the comparator output to become more immune to the noise signal. 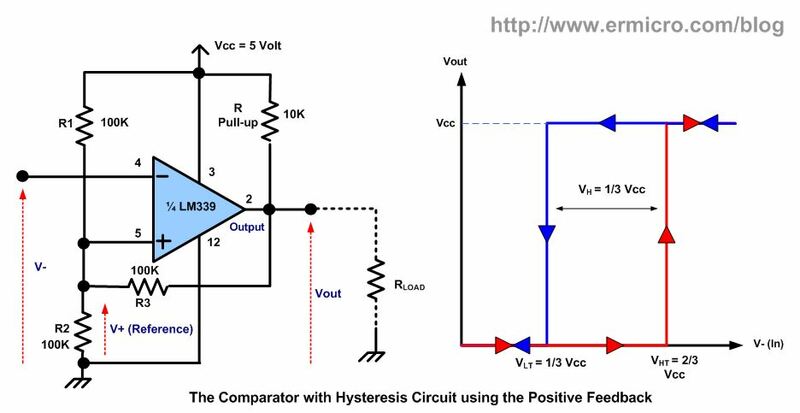 This hysteresis comparator circuit also could be used as a Schmitt Trigger with the adjustable threshold point by just changing the value of R1, R2 and R3 resistors respectively. Again to analyze this circuit first we assume the Vout is high, this will turn on the TR1 transistor and the LED will be ON. In order to meet this condition the V- should be less than V+ (V- almost zero) or we could say that the C1 is now being charged through the R4 resistor. Now the V- will slowly increase and because of the voltage shift provided by the R3 feedback resistor on the V+ input; this will make the Vout rapidly swing to the logical low (LED OFF) and this time the C1 will discharge its energy through the R4 resistor and the V- will decrease; when it reach bellow the V+ then the process will repeat again. You could easily change the LED blink rate by changing the R4 and C1 value respectively. 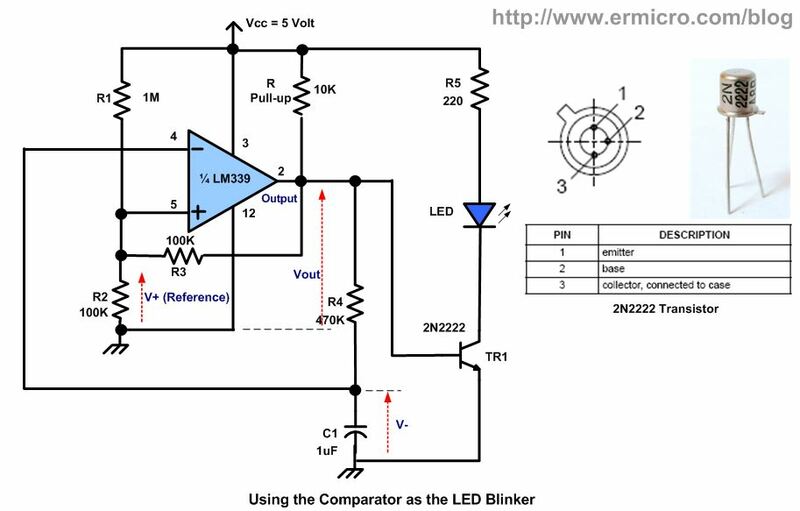 By using different R4 and C1 values on each comparator in the LM339 package (four comparators) you could assembly four independent LED blinker with each of them have a different blink rate. 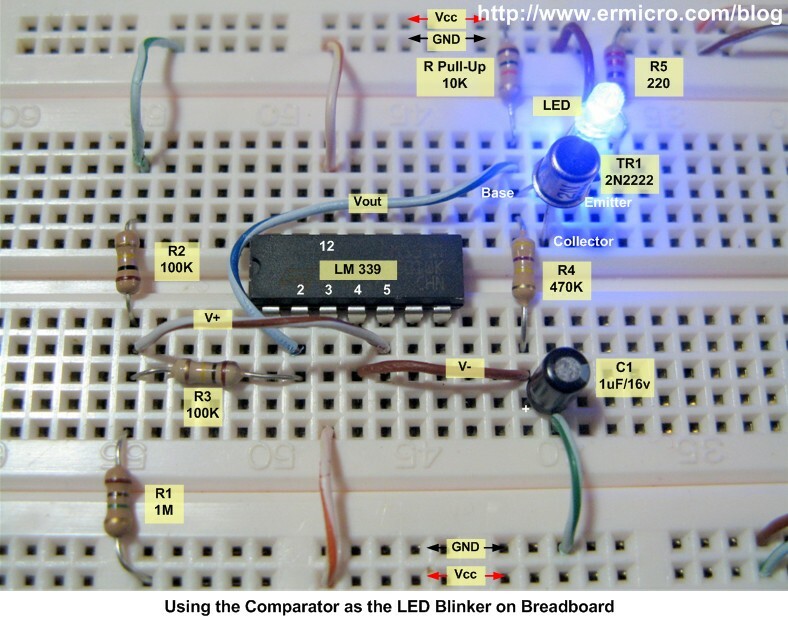 By hooking up to 4 LEDs on each 2N2222 transistor you could get a very nice random LED blink effect similar to the main computer panel shown on many sci-fi movies. Therefore if Vin is greater than V1 and V2 (Vin > 2/3 Vcc) then the comparator CMP1 output will swing to the logical low and make the TR2 to turn OFF (LED2 OFF), while the comparator CMP2 output will swing to the logical high, this will power the TR1 base make the TR1 to turn ON (LED2 ON). When the Vin is less then V1 but greater than V2 (1/3 Vcc < Vin < 2/3 Vcc) then the comparator CMP1 output will swing to logical high and make the TR2 to turn ON (LED2 ON). The comparator CMP2 output also will swing to the logical high, this will provide the necessary voltage input on the TR1 base to make it ON (LED1 ON). The last when the Vin voltage goes bellow the V1 and V2 (Vin < 1/3 Vcc) then the comparator CMP1 output will swing to logical high and make the TR2 to turn ON (LED2 ON), while the comparator CMP2 output will swing to the logical low and make the TR1 to turn OFF (LED1 OFF). Therefore by adjusting the VR1 and VR2 you could easily adjust the Vin and set the upper and lower voltage reference level limit as necessary. 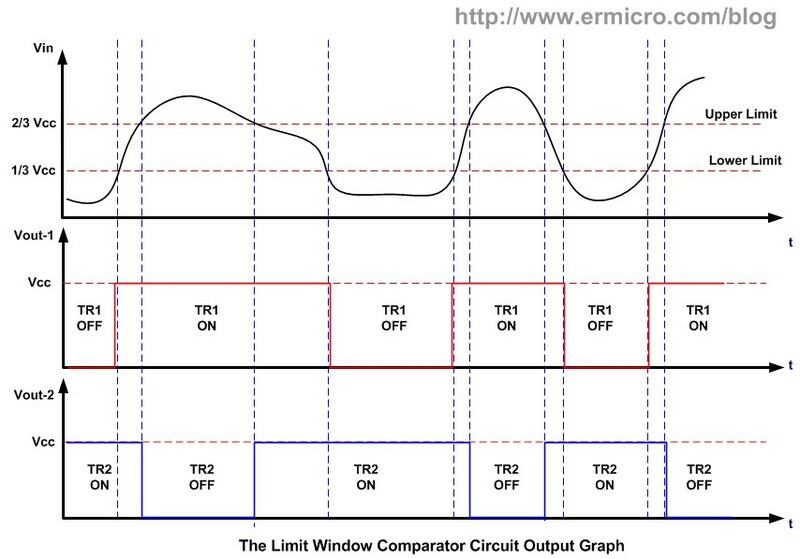 By connecting both comparator open collector output (wired-OR) we could get the desired response, where the output only swing to the logical high (“1“) when Vin voltage is within the Lower and Upper limit voltage. 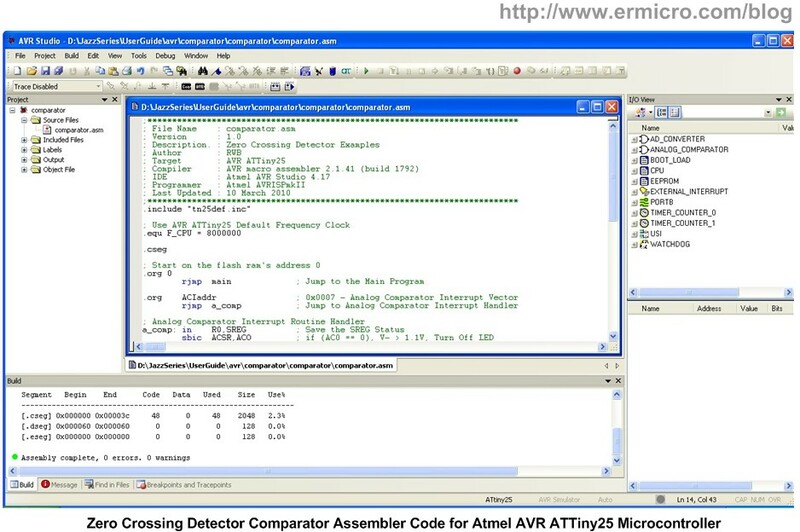 On this last comparator tutorial we will take a look at the comparator circuit inside the microcontroller. Most of today’s modern microcontroller has already equipped with this feature. Usually it being used as the zero crossing detector circuit, where it takes two analog inputs and compares them; then produce the interrupt according to the voltage input level on both input. 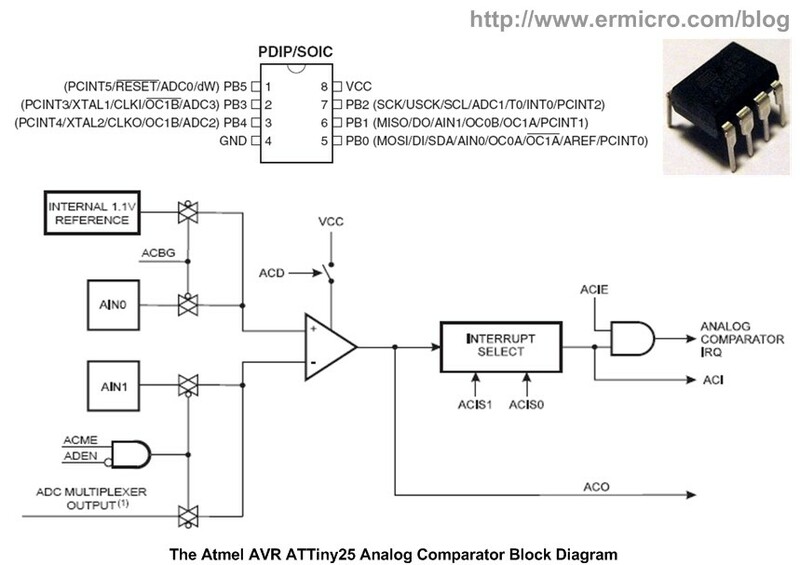 Now let’s take a look at the Atmel AVR ATTiny25 microcontroller; it’s one of the smallest and yet powerful 8-bit 8-pins AVR family microcontroller which has a build in one powerful analog comparator circuit inside. The AIN0 (PB0) could be used as the comparator’s non-inverting input and the AIN1 (PB1) could be used as the comparator inverting input. We also could choose to use the AVR ATTiny25 microcontroller internal reference voltage 1.1 volt connected to the non-inverting input. 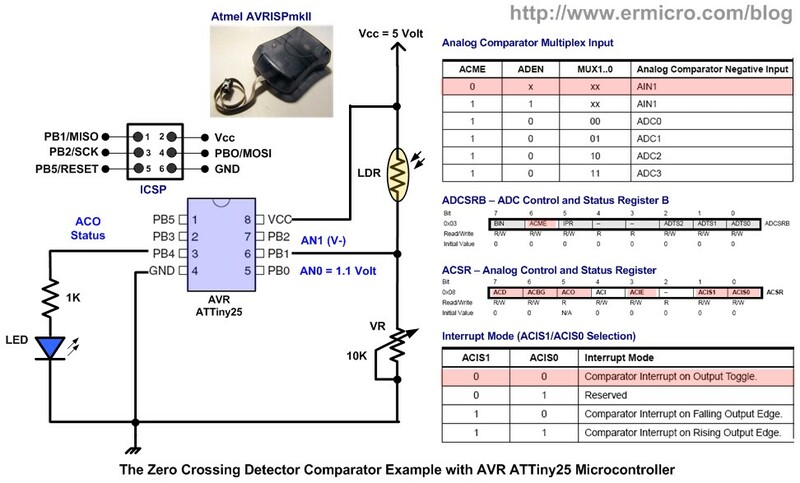 To understand how this analog comparator works, I use a simple circuit to demonstrate how we could use the microcontroller analog comparator as the zero crossing detectors. This time I will take advantage of the internal reference voltage on the non-inverting input and connect the comparator inverting input to the LDR and trimport. 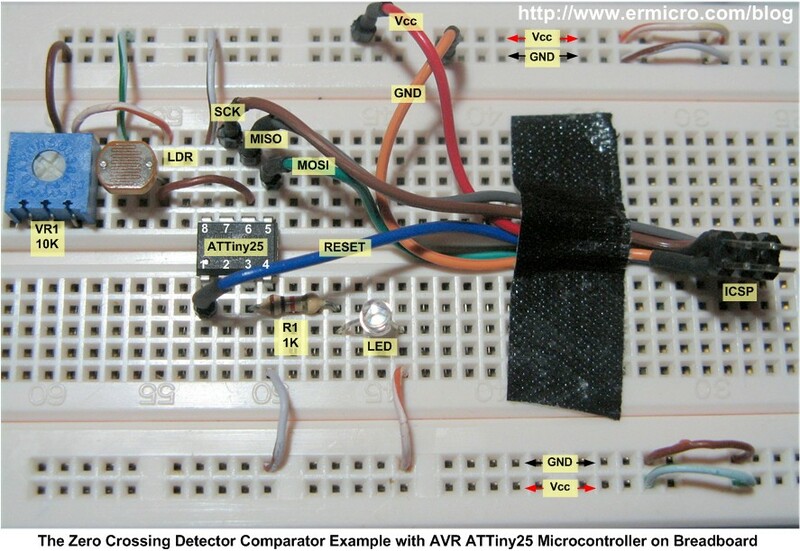 This following schema shows you the example of light detector using the ATTiny25 microcontroller analog comparator feature. The analog comparator inside the Atmel AVR ATTiny25 microcontroller is capable to use multiplex inverting analog input from ADC0, ADC1, ADC2 and ADC3, but on this tutorial I will use the AN1 (PB1) as the inverting input which connected to the LDR and 10 K trimport voltage divider circuit. By clearing the ACME (Analog Comparator Multiplex Enable) bit on the ADCSRB register, we simply disable this feature. 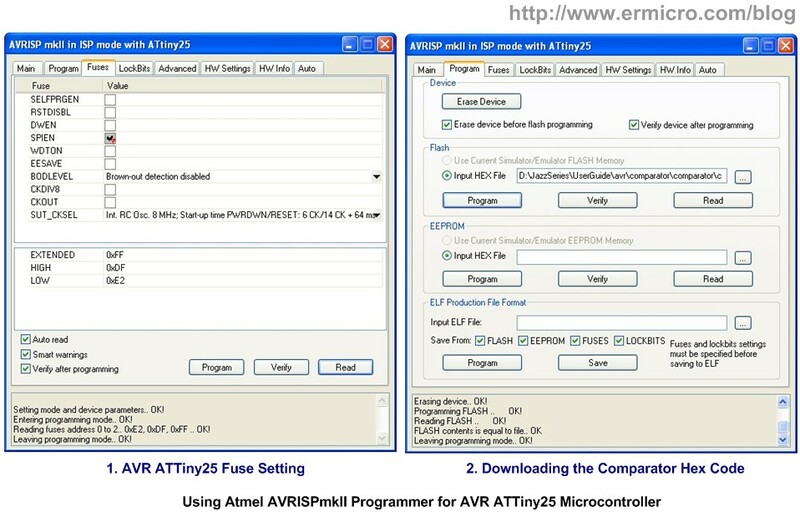 Using the powerful Atmel AVR Studio v4.17 integrated development environment you could easily compile and debug this AVR assembler code, and then down load the hex code into the ATTiny25 microcontroller flash ram using the AVR microcontroller programmer; on this tutorial I used Atmel AVRISPmkII programmer. The comparator or op-amps in general is one of the breakthroughs in the integrated circuit development as this tiny smart circuit has tremendous applications in electronics industries. Therefore understanding of how the comparator work will help you take the advantage of this amazing circuit in your next electronics or embedded system project. 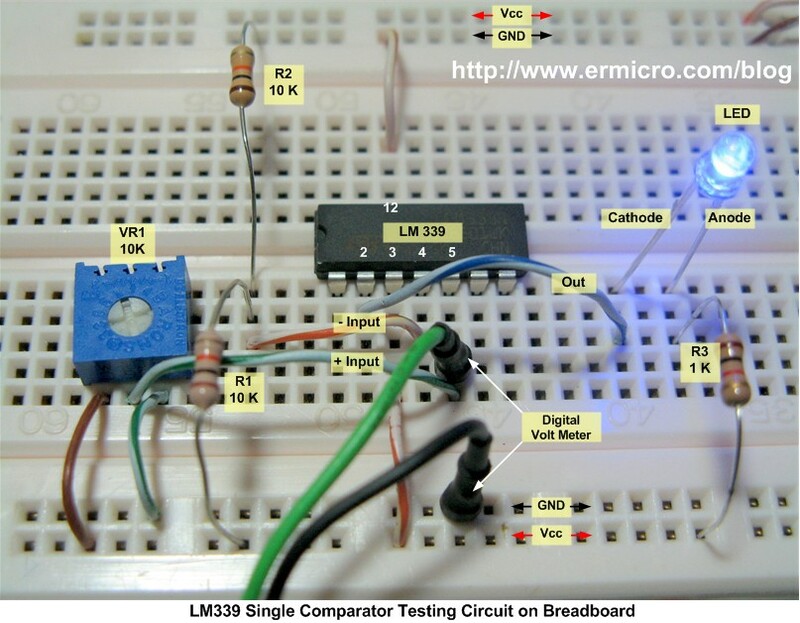 LM324 Op-Amp is not a real comparator, use LM339 instead. I have a question here…can infrared sensor detect black colour?? I know when infrared sonsor is approaching a white or reflective surface, its sensor output voltage will decrease. But when I tested it with black surface, the result is the same as normal condition, it means no voltage change occur. So, how if I want my infrared sensor to detect black colour surface? Sure it can, infrared actually is a light with a wavelength that is invisible to our eyes, therefore the dark surface will absorb most of the light while the bright surface will reflect most of the light. You could read more about using this infrared sensor on “Build Your Own Microcontroller Based PID Control Line Follower Robot (LFR) (Second Part)” and “PIC18 Pulse Width Modulation (PWM) DC Motor Speed Controller with the RPM Counter Project” articles. i m new n preparing my first line follower ..
al though i m not able to grassp all things above. Will some good Samaritan please give me a simple circuit diagram using LM 339 or LP 339 for temperature control of an incubator (chicken) – the voltage used is 12V dc – the incubator heater to be connected thru a DPDT switch. The whole system’s power source is a 12V automobile battery. The sensor for temperature would be a thyristor – and a potentiometer to set the desired temperature inside the incubator. Thanks Mr Triac, that’s the alternative way to connect the LED. 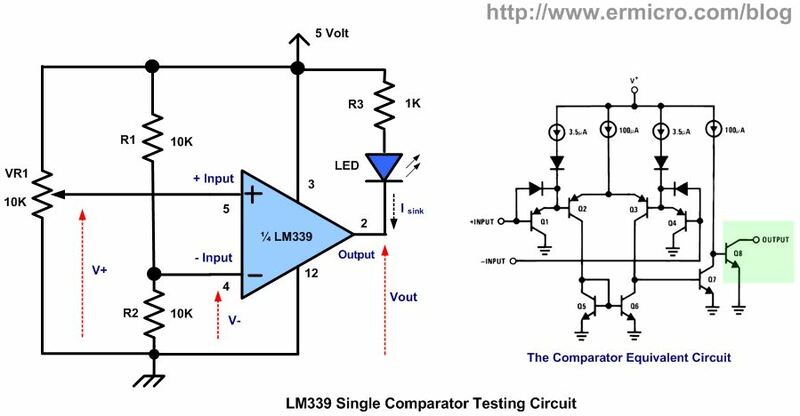 The LM339 output is not necessary has to be Vcc (5 Volt) in order to make the LM339 start to oscillate (LED On and Off), the 0.7 volt is already enough to start the oscillation. As you could see from the video this circuit is working nicely. Basically I want to interrupt a power supply (electronic switch). Power supply is 7VDC. I need to interrupt or open the ckt only while a green LED is energized from a different ckt. The duration of the green LED voltage drop (when it’s energized) varies from 40ms to 30000ms. I figure there’s not a lot of components to wire-up for this, it’s just a matter of knowing what components to get and how to wire them. 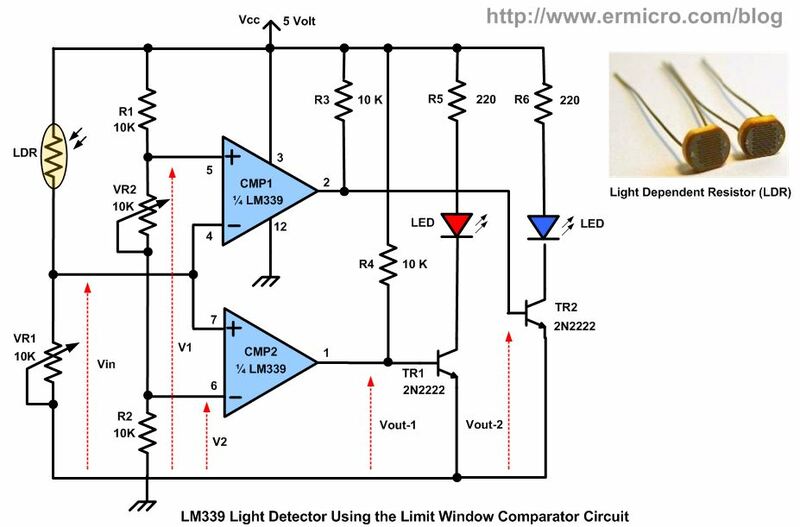 You could try to use the voltage level detector circuit (see the infrared reflector detector circuit using LM339 picture), where you could replace the infrared with the green LED (come from another circuit). 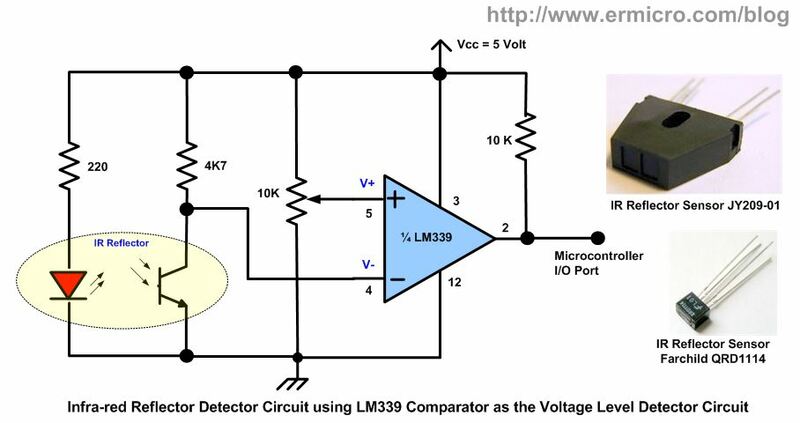 Hi, I am working on using lm339 as a battery charger, I need a circuit that can detect when the battery is either low or charged and switch on a relay, can you help with a good circuit? We are sorry that we could not provide the circuit. 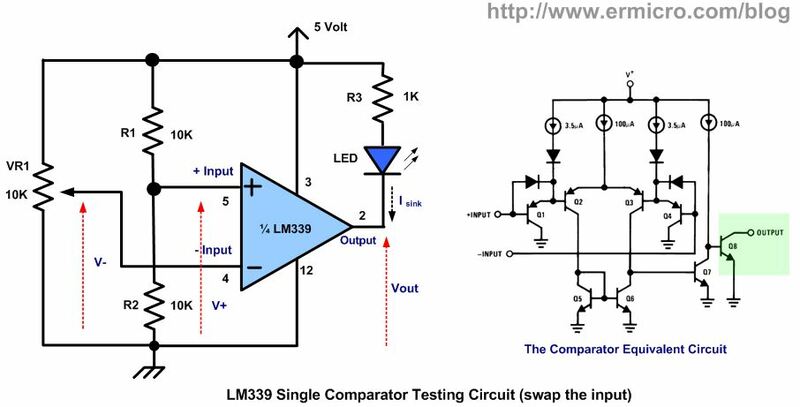 Its very simple you need to use LM339 and use 2 Comparators. one for Battery Full voltage Detector and another for Low Voltage Level Detector. Just use preset to set the VREF for both the signals and connect it with battery terminal. When the signal will be detected output will be Logic 1 (5V) and you can use that on the Base of Transistor like S8050 to turn on relay or do whatever you like upto 800mA..